Clivia is a tropical plant native to South Africa. Although it sometimes is called bush lily, clivia is a member of the amaryllis family. Clivia has glossy, green, strap-like leaves, and flowers that bloom in clusters on tall stalks. Most clivia blooms are orange, but some varieties have peach, off-white, yellow, red or apricot flowers. Clivia is fairly easy to grow and works well as a houseplant in areas above USDA Hardiness Zone 9. Clivias require a cool, dry resting period in late fall. During this time, withhold water and keep the room temperature at 50 to 65 degrees Fahrenheit, per recommendations by University of Illinois Extension. If your clivia doesn't get this rest starting in late October through the end of January, it will continue growing, which means new leaves but no flowers. Clivias bloom more profusely if they are slightly rootbound. Mealybugs, also called wooly aphids, are a scale insect coated with a powdery, waxy secretion. They can feast on your clivia's leaves and flowers, making them unsightly and possibly leading to the plant's death. To get rid of mealybugs, dip a soft cloth or cotton swab in rubbing alcohol and apply it to the insects. Repeat this in seven days to catch any newly hatched mealybugs. 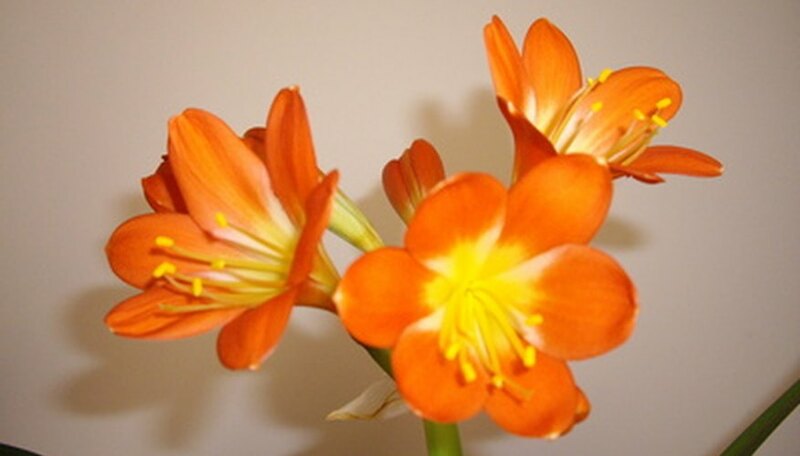 Clivias grow better in bright, indirect indoor light, and shade if grown outdoors. Direct sunlight can scorch the leaves, causing them to turn brown and wrinkle; it also may cause the flowers to distort. Overwatering or underwatering your clivia may lead to shriveling and leaf-color changes. While clivia do well with a lot of water during the active period, do not let them sit in a saucer of water or have their roots continuously wet. However, do not let your clivia totally dry out between waterings; it should be watered when the top inch of soil has dried.